5 reasons why Draco Malfoy is the BEST Harry Potter character! If birthdays weren’t amazing enough anyway, imagine if you were part of the wizarding world of Harry Potter while celebrating the day you were born all those years ago? We can only imagine it’d be even more magical. 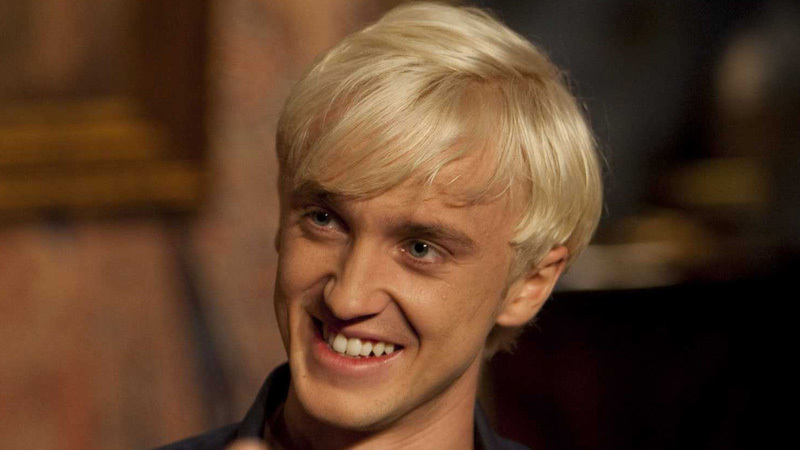 And today is that magical day for a certain Mr.Tom Felton – Happy Birthday you blonde haired beauty! Thank you for forever changing the way that we say ‘POTTER’. Maybe he’s born with it, maybe it’s an amazing spell – you can’t mention Draco Malfoy without paying homage to that amazing head of bleached blonde hair of his. Who knew being bad could look so good? He make be wickedly bad, but deep down, he’s a family man. We mean, he’s willing to kill flipping Dumbledore so his parents are safe from Voldemort. Yes we know, we know – he’s parents Lucius and Narcissa are right pieces of work, BUT they are his family nonetheless. We love how he acts all tough on the surface, but when it comes down to it, he’d just go running to his daddy like we all do. He always managed to make us laugh with his rich kid tantrums and strops. Again, Draco may act like a big strong boy who can take care of himself, but you know, the poor guy’s dealing with a LOT of stuff. So it’s not surprising that he breaks down and has a little cry every now and again. We love a sensitive guy.